Ahh.. the Caribbean, the ultimate vacation destination. After a few months of alien annihilation, Duke's ready for a little R&R. That is, until the alien scum drop in for a little vacation of their own. He utters some witty remarks as usual and cleans up the situation. Includes 7 new levels plus one secret level, as well as all new weapons (squirt guns, coconut launchers, and more), new beach-clad monsters, 4 extra DukeMatch levels, and new tropical background music. Players venture through many Caribbean locales including water parks, beach side hotels, tropical lagoons and cruise ships throughout the course of the game. It introduces exotic alternatives to the items the player picks up, from Credit Cards to Snorkels. Health is represented by bananas (with the Atomic Health replaced by a Pearl). Works with version 1.3d and up. 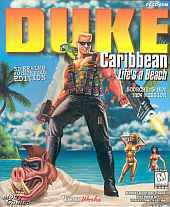 In 2013, a Duke Nukem 3D: Megaton Edition by Devolver Digital that included Duke Caribbean: Life's a Beach, Duke it out in D.C., and Duke: Nuclear Winter used a new engine that runs natively under new operating systems with enhanced OpenGL graphics.